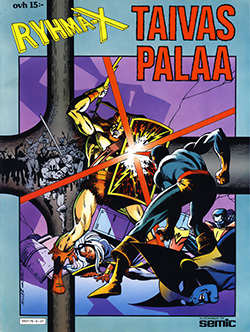 The first ever X-Men album was published in Finland in fall 1985. The album is titled “Taivas palaa” (lit. Heaven On Fire) and it consists of just one story. With only 32 pages + covers the album could just as well have been a normal magazine, and based on the fact that the pages have huge margins the only difference to magazine size is that the comic is printed on larger pages, has thick covers and better paper than in the normal comic magazines. The album also costs twice as much as a normal Ryhmä-X magazine. So, one would think, to justify the extra cost this story must be so profound they had to give it special attention, right? Here Akon asks Storm to help him - nicely. It’s actually a sort of a miracle they were able to stretch the story as long as 32 pages. First some kind of a barbarian appears in New York and goes looking for Thor, who isn’t in the Avengers building. Since that was a dead end he goes to the X-Men Mansion, fights the X-Men, and kidnaps Storm. Then the X-Men follow Storm to the barbarians’ homeworld, and fight, fight, fight. Then Nightcrawler finds Storm, who has changed into “a more cozy” outfit. He alerts the rest of the X-Men. When all the X-Men are in one place the barbarians tell the barbarians’ homeworld is ruined unless Storm saves it, but the strain will kill her. She’s willing to die, but with the help of the rest of the X-Men they manage to save the world and keep Storm alive. The end. Logic, where did it disappear? I can understand the X-Men stories are filled with fight scenes because people want to see them use their special mutant powers and there is no better way to do that than to show them in battle. If they didn’t fight, they could be just anybody, right? But still, I’d hope there was at least some believable excuse for them to engage in battle. In fact, in the very beginning of the story the X-Men are in the Danger room practicing and using their powers. Jolly good. No complaints about that. But after the battle, Storm, who panicked mid-practice and is now upset about her losing control, goes to her upstairs garden. There Arkon the Magnificent (fin. 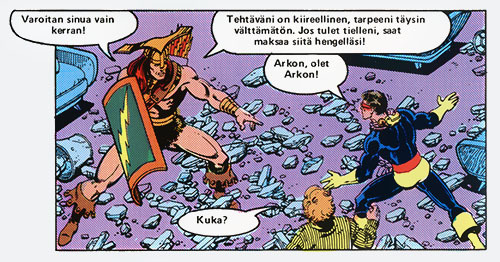 “Arkon Suurenmoinen”) – what a silly name – attacks Storm, which leads to him battling everyone in the team. In the end he shoots an arrow at Storm, which transfers her to Arkon’s homeworld. Arkon, acting like a barbarian, though according to Wikipedia is the ruler of his people, uses his barbarian brain and ensues in battle instead of just shooting the arrow at Storm right in the beginning. Geez! In this caption you see Arkon trying the peaceful solution, ie. threatening to kill the X-Men if they interfere with him kidnapping Storm. Here we see a vizier pondering why their peaceful negations always fail. Hint: don't send Arkon to negotiate. Then later when the X-Men have found their way to Arkon’s homeworld, a local vizier riding to a castle where Storm is held, thinks: “I had hoped we didn’t have to do this. That we could have received help without battle. / But we didn’t succeed in peace.” Wait, when did they try a peaceful solution? Or was that the part when Arkon went knocking on the Avengers’ door? Quite lame attempt because the next time we saw him trying to “ask” for help he was holding Storm by the throat and telling the other X-Men to stay out of his way or he’d kill them. Nice job. Later on page 26 Arkon explains his actions. He said he couldn’t take the risk the X-Men would refuse him. Well, if he was going to fight them anyway then why not ask and if refused then fight them. It seems Arkon needs to learn some diplomacy. What an idiot. The most saddening part of this was that this story got its own album. I would have rather seen some really good story receive its own publication. Now it seems they just came up with an idea to put up an album and just chose any story. 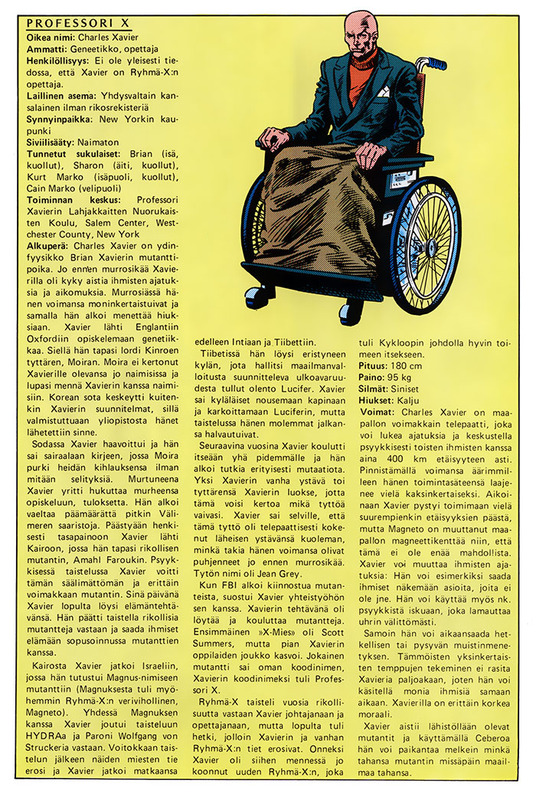 And I’m quite sure this is one of those stories which would have never been published otherwise but had originally been dropped out because it’s not as high standard as the rest of the stories published in Ryhmä-X magazine. The story was written by Chris Claremont and it’s always sad to see a very good writer put out something like this. Then again, no matter how good you are you have to fail sometimes. It’s only human. These were originally designed for Thor. Then again, I have a hard time forgiving the fact that in this album Wolverine, who usually speaks like all the other members of the team, is suddenly given a goofy tone. And with that I refer to Goofy (fin. “Hessu Hopo”), who is the only Disney character in Finland who doesn’t speak literary language but spoken language. The spoken language makes him sound bit more silly than the rest of the crew. And you can bet when Wolverine starts to speak like Goofy amongst literary language speakers he sounds like a hillybilly. Not my Wolverine! Well, that’s probably not thanks to mr. Claremont, but thanks to Mail-Man, who does the translations also for the magazines. BUT then there is one occasion where Wolverine starts to show off his bad side once again. On page25 he tells Ororo, who has asked the X-Men to leave: “Not without you, babe.” Babe? Are you sure about that, Wolverine? Well, it must be that hot outfit the barbarians had made for Ororo that got his head spinning. Why do they always make new outfits for the women? Couldn’t she save the world in her normal wear? Or maybe that outfit was designed for Thor as he was supposed to come to their aid in the first place. I doubt he would have been as willing to change into that. I must admit I had to read the album twice to be able to write this post. That’s how memorable the story was to me. I read the story about a week ago and when I picked it up to write this story I realised I had no recollection of its plot and had to read it again. I hope you see the tragic in this. I will never be able to regain those 20 minutes I spent on reading this again. Note that I also fell asleep in the middle of the story and therefore lost also one hour sleeping. I’m not impressed. At the end of the album there was also this datasheet of Charles Xavier. Most of it tells his story, but in the end they list his special mutant powers. In between listing his psychic powers it also says: "Xavierilla on myös erittäin korkea moraali." (eng. "Xavier also has very high morals.") Well, quite a power it is.